“The general tank plan was that all tanks would land on the main beach at Dieppe in successive waves. “C” Squadron would assist the Essex Scottish in establishing the bridgehead and taking care of the armed trawlers in the harbour. They would then cross to the high ground on the east side of the River D’Arques to dominate the approaches to the east. “B” Squadron was to assist the Royal Hamilton Light Infantry in establishing the right flank of the bridgehead. They would then push inland and take the aerodrome (airfield) at St. Aubin with The Queen’s Own Cameron Highlanders of Canada. “A” Squadron was in reserve and would land later. Once the beachhead was secure, the headquarters of the German 302 Infantry Division at Arques la Battaille would be captured by the Camerons, aided by either “A” or “B” Squadron depending on the tactical situation. 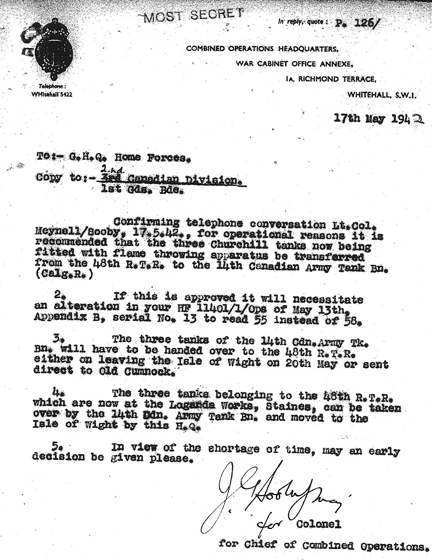 The British Combined Operations Headquarters letter dated 17 May 1942, from the Combined Operations Headquarters to General Headquarters Home Forces, in which it was recommended for operational purposes that the three Churchill tanks fitted with the Oke flame throwing apparatus be transferred from the 48th Battalion, Royal Tank Regiment, to the Calgary Regiment. Source: Authors’ collection. On the main beach at Dieppe, the main sequence of events was as follows. Despite the heavy bombardment from the sea by naval forces and from the air by bombers, the enemy’s concealed positions in front of the town itself were not destroyed. They were still able to bring intense fire to bear on any point on the main beach from the moment it was assaulted. The first wave of the Calgary’s tanks got ashore successfully, and some of them assaulted the town. Others, however, were not successful in negotiating the sea wall and did not get off the beach. A number of them soon were immobilized. Nevertheless their crews continued to fight their guns, engaging enemy positions with good effect. The convening authority for the transfer of T31862, T32049, and T32422, from the 48th Battalion, Royal Tank Regiment, to the Calgary Regiment (who at this time bore the designation of the 14th Canadian Army Tank Battalion (The Calgary Regiment (Tank))). Source: Authors’ collection. Roads leading into the town were solidly blocked and, in order that the tanks might successfully penetrate into the town, it was essential that these be cleared. The engineers were carrying large quantities of selected explosives for this purpose. Unfortunately, however, the heavy fire that the enemy was still able to bring to bear on the beach caused heavy casualties amongst the sappers (engineers). Despite great courage and determination, they were unable to clear the road blocks. This made it extremely difficult for the tanks to get into the town at all. Consequently the majority of the tanks fought the whole of the engagement from the beach and promenade. By the beginning of 1942, under the auspices of the Petroleum Warfare Department and the Ministry of Supply, the British had begun to carry out research and development of tank‑based flamethrowers as a potential offensive weapon. Various prototypes based on the Infantry Tank Mk III, Valentine, were developed and tested, using a two‑wheeled trailer that carried the fuel for the flamethrower apparatus mounted on the tank. After the tests, Major J.M. Oke of the British Army suggested that the jettison fuel container that most tanks were equipped with at the time be used in place of the trailer. The Lagonda Car Company of Feltham, Slough, took up this idea, connecting the jettison fuel container to a Ronson‑type flame projector. They fitted the complete system into a Churchill Mk II tank, which eventually came to be known as the Churchill “Oke.” Having observed trials of Lagonda’s prototype, Lord Louis Mountbatten, the Chief of Combined Operations, pressed for the full development of Lagonda’s concept for operational service. In the centre of this photo from Dieppe, is T68875 Beetle, a Churchill Mk II (Special) of No. 8 Troop, “B” Squadron, The Calgary Regiment, which was fitted with the Oke flame-throwing system. 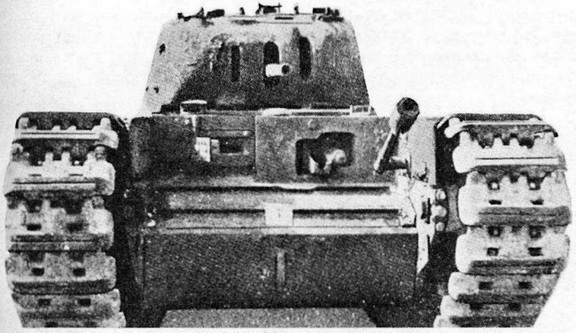 As can be seen, the flame projector was mounted in the front of the tank on the left of the hull gunner’s position and protruded out between the hull machine gun and the left front horn of the tank, the muzzle of which can be seen sticking up above the left track. The tank to the right rear of Beetle, on the shoreline, is T68881 Ringer, a Churchill Mk II, of Regimental Headquarters, The Calgary Regiment. Source: Authors’ collection. 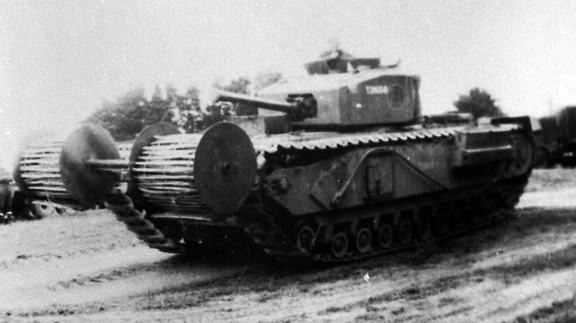 The Churchill “Oke” was basically a Churchill Mk II tank, with a complete Ronson type flamethrower system installed, which consisted of having the rear mounted jettison fuel container connected up to a feed pipe which passed through the left pannier and was itself connected to a flame projector in the front of the tank. The flame projector was mounted in the front of the tank on the left of the hull gunner’s position and protruded out between the left of the hull machine gun and the left front horn of the tank. The flame projector was operated from the hull machine gunner’s seat, and because it was mounted in a fixed position and elevation, the tank had to turn to engage any intended flame target. The basic operation of the flamethrower was that compressed carbon dioxide gas propelled the flame fuel from the jettison fuel container to the flame projector. There, a trigger mechanism opened the pintle valve in the flame projector’s nozzle and projected a jet or pencil of fuel. The carburetor bled petrol into the stream, which was then lit by the action of a spark plug. The range of the Oke flamethrower was 40 to 50 yards. In May 1942, No. 10 Troop, “B” Squadron, 48th Battalion, Royal Tank Regiment, was sent to the Lagonda Works at Staines. 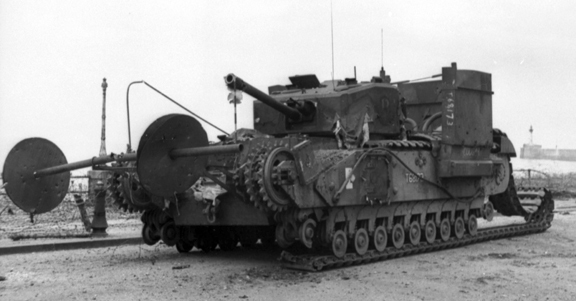 There, their three Churchill Mk II tanks (T31862, T32049, and T32422) were fitted with the Oke flame‑throwing system. 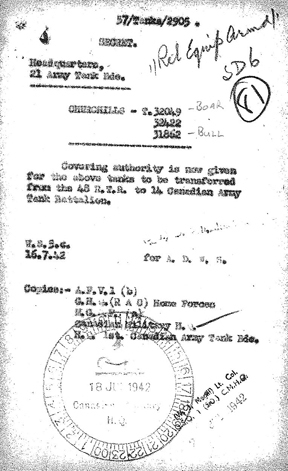 In a British Combined Operations Headquarters letter dated 17 May 1942, from the Combined Operations Headquarters to General Headquarters Home Forces, it was recommended for operational purposes that the three Churchill tanks fitted with the Oke flame‑throwing apparatus be transferred from the 48th Battalion, Royal Tank Regiment, to The Calgary Regiment. This recommendation was subsequently approved on 18 June 1942, and the transfer took place on 20 June 1942. In Canadian service, these three tanks were designated Churchill Mk II (Special). 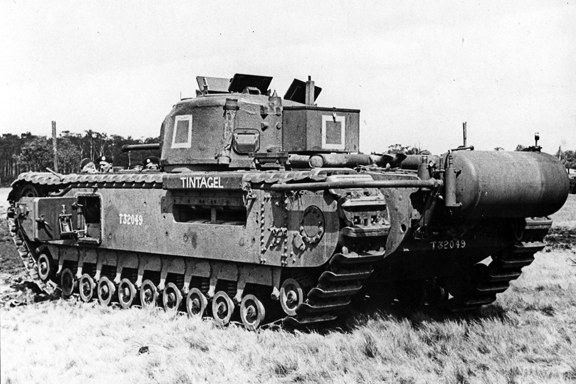 The Churchill Mk II (Special) tanks were crewed and operated by No. 8 Troop, “B” Squadron of the Calgary Regiment. Although I have been unable to determine exactly when this occurred, sometime before 19 August 1942, the Oke flame‑throwing apparatus in T32422 was removed and fitted into T68875, another Churchill Mk II tank. T32049 Tintagel, a Churchill Mk II of No. 10 Troop, “B” Squadron, 48th Battalion, Royal Tank Regiment, fitted with the Oke flame-throwing system. As can be seen in this photo, the rear mounted fuel container is connected up to a feed pipe which passed through the left pannier, which was itself connected to a flame projector in the front of the tank, as explained in the text. T32049 (fitted with the Oke flame-throwing system) was transferred to The Calgary Regiment’s charge on 20 June 1942, where under the name of Boar (No. 8 Troop, “B” Squadron), she was subsequently lost at Dieppe on 19 August 1942. For Dieppe, the rear mounted flame-thrower fuel reservoir, was enclosed within an armoured hexagonal shaped box. Source: Authors’ collection. The use of the tank mounted “Oke” flamethrower by the Calgary Regiment at Dieppe, although rudimentary in nature, led to development of a more advanced model, of a tank-mounted flamethrower, again based on the Churchill chassis, which came to be known as the Churchill Crocodile, seen pictured here. The flame projector on the Crocodile, replaced the hull mounted machine gun, and had a range of 80 to 120 yards. The armoured fuel trailer, held 400 gallons of flame fuel and enough compressed nitrogen propellant for 80 one second bursts of flame through the flame projector. This trailer was connected to the tank by a three-way armoured coupling and could be jettisoned from within the tank if necessary. Source: Authors’ collection. – T31862 Bull was the troop commander’s (Captain B.G. Purdy) tank and was launched prematurely and drowned in 10 feet of water approximately 100 yards offshore. – T32049 Boar, commanded by Sergeant J. Sullivan, in making a heavy landing from Tank Landing Craft 3, knocked her flamethrower fuel reservoir off her rear plate, but managed to cross the beach and get onto the promenade in the area of the Cassino. She remained mobile throughout the morning before being ordered back to the beach to cover the withdrawal. Once back on the shoreline, she was immobilized and acted as a pillbox. – T68875 Beetle, commanded by Lieutenant G.L. Drysdale, also landing heavy, broke a track pin on her right track and remained immobilized on the shoreline, at the eastern end of Red Beach, also acting as a pillbox. Although the Churchill mounted, Oke flamethrower was rudimentary, by their presence at Dieppe, it is considered to be the first time that a British‑designed tank flamethrower took part in battle. 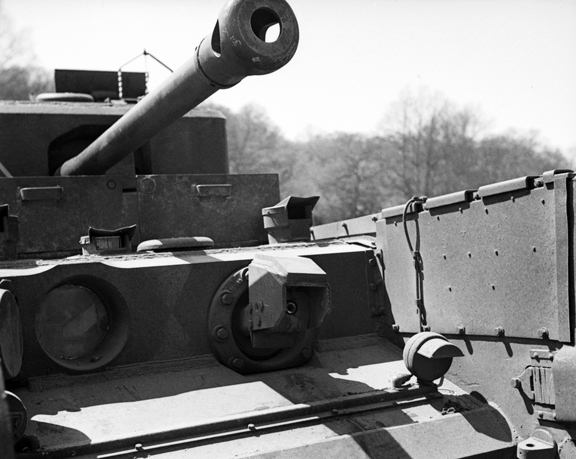 A closeup of the flame projector, which replaced the hull mounted machine gun, on the Churchill Crocodile. Source: Authors’ collection. The main beach at Dieppe, over which the Churchill tanks of the Calgary Regiment were to land, was entirely composed of rounded and oblong chert rocks which range from one to six inches in diameter, and was resistant to cracking or breaking. Tidal action, leave most of these chert rocks eventually resting on the beach surface at an angle of about 15 to 20 degrees. With these rocks being many metres in depth, vehicles would not be able to dig down to a solid base for traction. If a tracked or wheeled vehicle tried to climb up this slope, it would immediately dig itself down, and in the case of tracked vehicles, the strain of these chert rocks caught up between the drive sprocket and track, would cause the pins that held the track links together, to break, thus immobilizing the tank. Another view of the “Beach Track Laying Device,” during the trails conducted by the Combined Operations Experimental Establishment. Note the position of the roll of chespaling, which was set approximately 24-inches, in front of the track. Source: MilAt photo archives. 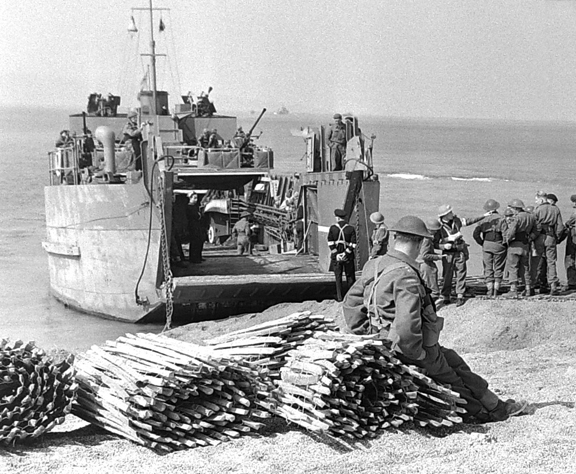 Originally, to alleviate the foreseen problem of these chert rocks, it was planned to have four‑man teams of Royal Canadian Engineers, carried in each of the six Tank Landing Craft, that were scheduled to land in the first wave, who would run out ahead of the lead tanks, and roll out bundles of chespaling tracks. Chespaling was flexible roll fencing similar to wood slat snow fencing, but made with tough split slats made of chestnut. It was thought that by using chespaling, both wheeled and tracked vehicles would be able to get over the worst conditions of the chert rocks on the beach. Each of these bundles weighed approximately 250 pounds, were 25 feet long and could be wired together to form a continuous track, and could be moved around by the engineers to suit the later waves of incoming Tank Landing Craft. It was also found that chespaling enabled a tank to climb a 28-inch high wall. A sketch of Major Sucharov’s design for the “Beach Track Laying Device,” dated 25 August 1942. Note the location of the rigid conduit, which had to be added for the protection of the wiring for the electrically fired small explosive charges, that released the rolls, and for those that jettisoned the whole device, and its path, back to the turret. Source: R.C. Harley. Because of the weight of these chespaling bundles, and taking into account the probability of high casualties amongst the four‑man teams of Royal Canadian Engineers, from enemy fire, it was decided that an alternate method of laying out these bundles of chespaling tracks, ahead of the leading tanks of the first wave, be developed. 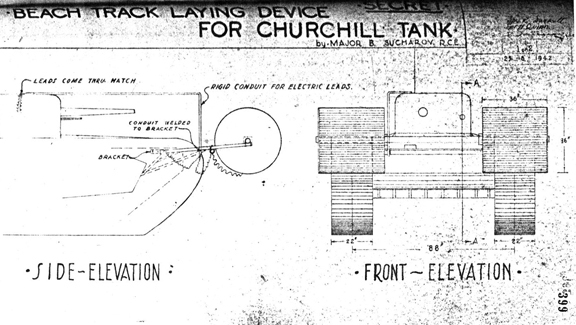 Major B. Sucharov, an officer of the Royal Canadian Engineers (who commanded the engineers Beach Assault Party at Dieppe), was assigned to develop a device to enable the tanks, not only to get over the beach on landing, but to get over the seawall that separated the beach from the Promenade. T31655 Buttercup, a Churchill Mk III of No. 9 Troop “B” Squadron, The Calgary Regiment, commanded by Sergeant J.D. Morrison, also one of five Churchill tanks of the regiment that was fitted with the “Beach Track Laying Device,” for the Dieppe raid. Having successfully landed and laid its chespaling and, having crossed the beach, wire, and seawall, it successfully jettisoned its beach track laying device, whereupon it engaged enemy targets on the west headland and in seafront buildings to the west of the Casino. Later, it returned to the beach below the Casino, where it took up a position on the water’s edge. It could not be destroyed by its crew prior to their withdrawal, due to the number of infantry wounded who had sought shelter from enemy fire on its seaward side. Note that there are no remnants of the beach track laying device, on her front, it having been jettisoned successfully. Source: Authors’ collection. To this end, Major Sucharov came up with a carpet‑laying device using chespaling. He designed an apparatus that carried two separate rolls of chespaling, one for each tank track, which were suspended, about 24‑inches in front of each track, on a spindle that was supported by two short brackets above the front horns of the tank. The apparatus was mounted low enough to allow the tank commander a clear field of vision, and gave a clear field of fire for the turret mounted main armament and co-axial machine gun. On the inside and outside of each roll of chespaling, there was provided a 14-gauge metal disc shield, 3 feet in diameter to prevent the chespaling from fouling the brackets and spindle. Each roll of chespaling was 3 feet wide and 25 to 30 feet in length, with weighted ends that upon release, fell to the ground with the tank tracks themselves feeding out the rolls as the tank moved forward. The release of these rolls was controlled from the turret by means of an electrically fired small explosive charge. After use, the whole apparatus could be jettisoned by a small explosive charge, electrically set off from inside the turret. From the Yukon series of exercises that were held at the tiny fishing harbour of West Bay on the coast near Bridport, Dorset, bundles of chespaling, used for laying a track to enable disembarking tanks to cross the beach, can be seen on the left. These bundles weighed approximately 250 pounds, were 25 feet long. Source: Authors’ collection. Churchill tanks of The Calgary Regiment taking part in a series of exercises (Yukon I, 11/12 and Yukon II, 22/23 June 1942) that were held at the tiny fishing harbour of West Bay on the coast near Bridport, Dorset. 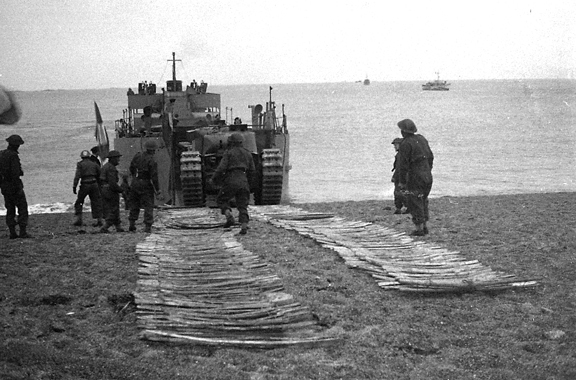 In this photo, soldiers of the Royal Canadian Engineers, have rolled out bundles of chespaling tracks to enable the disembarking tanks to cross the beach. Source: Authors’ collection. – T31124R Chief, a Churchill Mk I, carried in Tank Landing Craft 1 (No. 145), commanded by the Officer Commanding “C” Squadron, Major A. Glenn, prematurely laid its chespaling, and having jettisoned the beach track laying device, remained on the beach. For a time, Major Glenn kept his tank in a position from which he could observe the promenade and both flanks of the beach, when not obscured by smoke. After moving down the beach to the area in front of the Cassino, T31124R (Chief), returned the way it had came, and took up a position at the western end of the beached Tank Landing Craft 3 (No. 159) and turned broadside to the enemy, to protect the men sheltering behind the beached Tank Landing Craft. – T68173 Cougar, a Churchill Mk III, carried in Tank Landing Craft 2 (No. 127), No. 13 Troop, “C” Squadron, the Troop Leader’s tank, commanded by Lieutenant T.R. Cornett, successfully crossed the beach and having laid its chespaling, crossed the seawall onto the Promenade, having only jettisoned part of its beach track laying device. Whereupon, after turning to the west, it was immediately hit by a 75‑millimetre round that jammed its turret. After this, it was only able to engage the tobacco factory with its 6‑pounder main armament from its position on the Promenade. Eventually, after having broken one track and having the other blown by enemy fire, it was destroyed by its crew, prior to their retiring back to the beach. – T31135R Burns, a Churchill Mk I, carried in Tank Landing Craft 4 (No. 126), commanded by the Officer Commanding “B” Squadron, Major C.E. Page, removed its beach track laying device prior to landing, because it had been damaged. Having landed, Burns started to advance across the beach, but found its path obstructed by a tank trap consisting of a trench dug along the front of the esplanade wall. Upon attempting to avoid this obstacle, the tank’s right track was broken by enemy fire, which caused Burns, to be pulled into this ditch by the forward momentum of her left track, leaving her immobilized pointing downwards and unable to use its armament against enemy targets. – T31655 Buttercup, a Churchill Mk III, carried in Tank Landing Craft 5 (No. 121), No. 9 Troop, “B” Squadron, the Troop Sergeant’s tank, commanded by Sergeant J.D. Morrison, successfully laid its chespaling and, having crossed the beach, wire, and seawall, jettisoned its beach track laying device, whereupon it engaged enemy targets on the west headland and in seafront buildings to the west of the Casino. Later, it returned to the beach below the Casino, where it took up a position on the water’s edge. It could not be destroyed by its crew prior to their withdrawal due to the number of infantry wounded who had sought shelter from enemy fire on its seaward side. – T68557R Bob, a Churchill Mk III, carried in Tank Landing Craft 6 (No. 163), No. 6 Troop “B” Squadron, the Troop Leader’s tank, commanded by Lieutenant J.H. Dunlop, removed its beach track laying device prior to landing, also because of damage. It landed and successfully crossed the seawall near the Casino, where it engaged enemy targets with the 6‑pounder main armament until eventually returning to the beach, where it took up a position on the water’s edge to cover the withdrawal of the infantry. T68173 Cougar, a Churchill Mk III of No. 13 Troop, “C” Squadron, The Calgary Regiment, one of the five tanks fitted with the “Beach Track Laying Device,” for the landings at Dieppe on 19 August 1942. Having only jettisoned part of its beach track laying device, the remains of it are clearly visible on her front. Notice how the two short brackets carried the spindle, and that the inside and outside 3 foot diameter, 14 gauge metal disc shields, that prevented the chespaling from fouling the brackets and spindle, have closed up on themselves. Note also, the remains of the rigid conduit, on her right side, that had to be added for the protection of the wiring for the electrically fired small explosive charges, that released the rolls, and for those that jettisoned the whole device. Source: Authors’ collection. 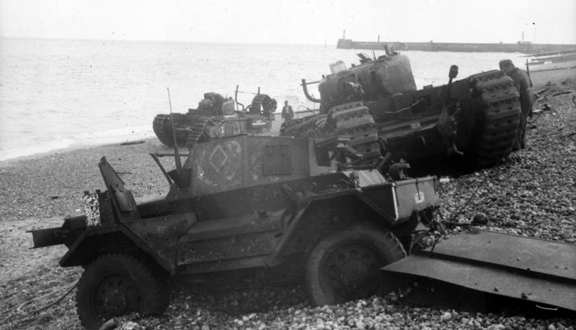 As mentioned in the text, the use of the “Beach Track Laying Device” at Dieppe, led to the development and production of various forms of mat layers to assist the passage of both wheeled and armoured vehicles over soft ground. The Bobbin Mk I and Bobbin Mk II, were two types of these mat layers that were developed. 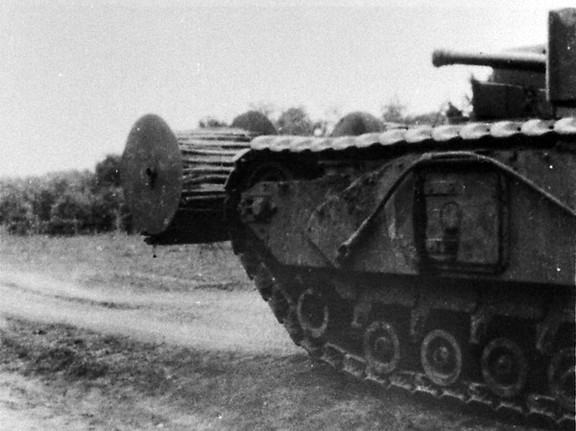 This photo shows a Bobbin Mk I, which carried a 9-foot 11-inch wide canvas mat on a spindle supported by short movable arms above the front horns of the tank, fitted to the front of a reworked Churchill Mk II tank. Source: Authors’ collection. After Dieppe, Major Sucharov’s concept of the “Beach Track Laying Device,” was sent to the Combined Operations Experimental Establishment, Appledore, Devon, for further evaluation and trails. These trails were conducted throughout the rest of 1942, and into 1943, but the device itself was never developed for operational use. The use of the “Oke” flamethrower and the “Beach Track Laying Device,” by the Calgary Regiment during the raid at Dieppe, was the first time that these equipments had been used in battle. 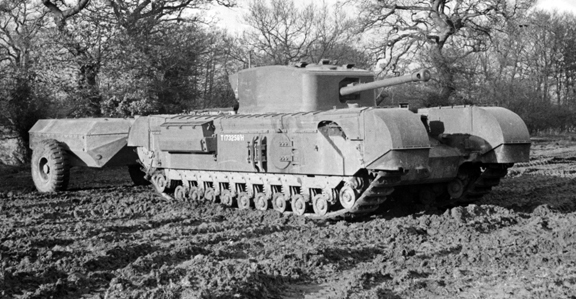 Although rudimentary in nature, both concepts were considered successful, leading to development of more advanced models, again based on the Churchill chassis. 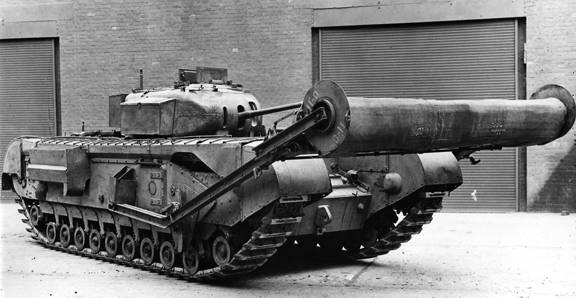 In the case of the three Churchill Mk II (Special) tanks with the Oke flamethrower, the concept of a tank‑mounted flamethrower led to the development and production of the Churchill Crocodile flamethrower. By May 1945, a total of eight hundred Crocodile units had been built. 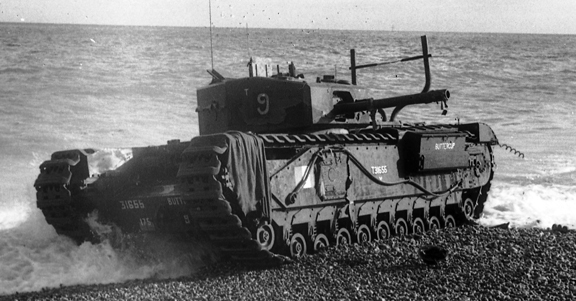 The use of the “Beach Track Laying Device,” led to the development and production of various Armoured Vehicles Royal Engineers that were based on the Churchill chassis. Some of these were fitted with various forms of mat layers to assist the passage of both wheeled and armoured vehicles over soft ground. Two types of these mat layers were the Churchill Armoured Vehicle Royal Engineers (AVRE) fitted with either the Bobbin Mk I or Mk II. The short arms on the Mk I were movable, while those on the Mk II were fixed. Another Churchill Armoured Vehicle Royal Engineers was fitted with the “Log Carpet Device,” which consisted of a carpet made up of one hundred 14‑foot long by 6‑inch diameter logs, which were bound together with wire rope. This log carpet was carried in a removable steel frame above the superstructure of the Armoured Vehicle Royal Engineers, and was released over the front of the vehicle by means of a small explosive charge. A diagram of the Churchill Armoured Vehicle Royal Engineers that was fitted with the “Log Carpet Device,” which consisted of a carpet made up of one hundred 14 foot long by 6 inch diameter logs, which were bound together with wire rope. This log carpet was carried in a removable steel frame above the superstructure of the Armoured Vehicle Royal Engineers, and was released over the front of the vehicle by means of a small explosive charge. Source: Authors’ collection. 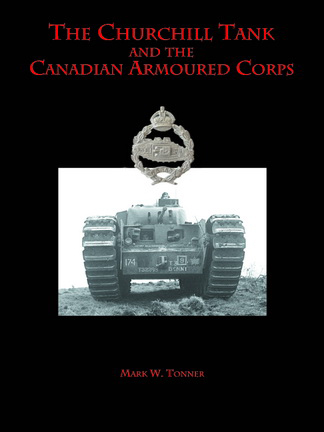 Note: In my two previous books [ii]dealing with the Churchill tank in Canadian service, I erroneously stated, that the rudimentary apparatus for forming a trackway carried on a bobbin on the front hulls, of some of the Calgary Regiment tanks at Dieppe, was a carpet laying device. This device, I had described as consisting of a single spindle supported by short arms above the front horns of the tank, that carried a mat of chespaling, that was 9 feet 11-inches wide by 25 to 30 feet long. Having recently been made aware of new information, I can now say, that I have set the record straight. You can ‘rate’ this post by clicking on the stars (below) and you can leave comments using the form at the bottom of this page. My uncle Ray Gilbert was in ” Beefy ” at Dieppe . What exact Churchill was Beefy ?